There’s nothing like easy, delicious, quick meals especially in the summer when the kitchen can overheat in a nano second. 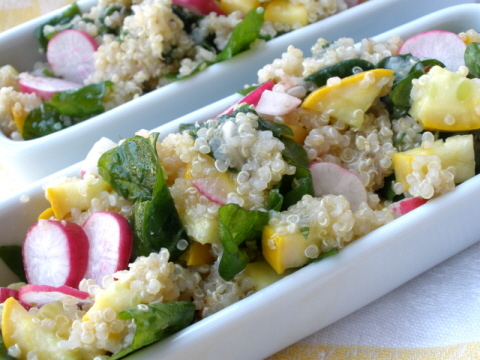 Quinoa is not only a quick cooking grain but has a rather high protein content making this simple salad a balanced meal. The radishes and arugula make for a pretty intense salad that should tide your taste buds over until dinner time. In a small sauce pan combine water and quinoa over medium heat. Cook until water has been absorbed, stirring occasionally, for about 15 minutes. Allow quinoa to cool to room temperature. In the mean time combine the remaining 7 ingredients in an airtight container. When quinoa has cooled stir into ingredients in airtight container. Allow to chill for at least 30 minutes prior to serving.